Posted on Tue, Feb 7, 2012 : 11:19 p.m.
After missing more than two weeks worth of basketball, it took Ypsilanti High School point guard Derrick Richardson a little time to get back into game-playing mode on Tuesday. He scored only two points in the first half against Skyline. But once the second half started, Richardson took over. 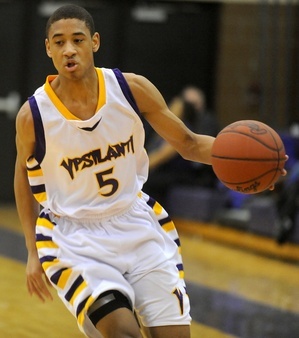 He scored 14 of his game-high 16 in the second half in Ypsilanti’s 67-45 win. Richardson returned to the lineup after sustaining a back injury two weeks ago. After the game, he spoke about the injury and how it felt to be back on the court. “I still got a little pain, but I’m just trying to fight through it,” Richardson said. Ypsilanti's Derrick Richardson, above, led Ypsilanti with 16 points on Tuesday in his first game since injuring his back on Jan. 27. The Phoenix (10-3, 7-0 SEC White) opened the game with a two quick baskets, but would struggle to score for the rest of the quarter. Luckily for Ypsilanti, Skyline’s struggles were worse. The Eagles managed two points in the opening stanza, despite numerous open looks. As the second quarter started, both offenses continued to clang shots off the rim, but it was Ypsilanti’s ability to capitalize on second-chance shots that made the difference. Mamadou Ba was especially helpful on the boards, pulling down 12 rebounds, including six on the offensive end, to go along with his four points. Despite being outrebounded, Skyline (7-6, 3-4 SEC Red) kept the game within reach, trailing 22-13 at the half. The score could have been closer, but Skyline turned the ball over nine times in the first half, adding to its offensive woes. Once the third quarter started, that’s when Richardson took over and helped push the lead into double digits. Brooks was happy to have Richardson back, but not just for his offense. “He really buys into our defensive scheme first of all, but he also takes pride in really shutting down the man that he is guarding,” Brooks said. Theron Wilson led the way for Skyline with 14 points and six rebounds, but was held largely in check for most of the game by Richardson. Before the game, Richardson was receiving treatment for his back injury so he could play. Brooks said that showed how tough and committed to his team Richardson truly is. Skyline was playing with a shortened bench and was missing three of its biggest players. According to Lovelace, starting center Jarrius Mann has been lost for the season for undisclosed reasons. Skyline was also without Jordan Woods and Marquis Wesley., but Lovelace said he expects those two back next week. Because of those missing pieces, Lovelace turned to his bench to fill in and looked at the challenge in a positive light.